The Black-chinned Weaver was formally described by Anton Reichenow, a German ornithologist and herpetologist. The Black-chinned Weaver was collected by Jose Alberto de Oliveira Anchieta, a Portuguese explorer and naturalist. 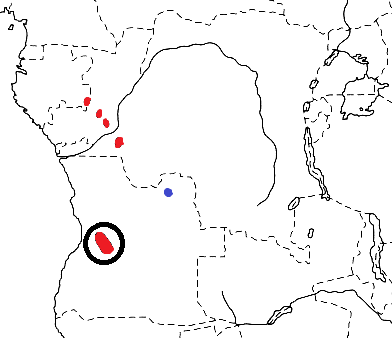 Anchieta moved to Angola with his family, in 1865. He lived in the region of Benguela, establishing a laboratory inside the ruins of a church, and exploring and collecting animals. In 1867, the Portuguese government hired him as a naturalist, but probably also as a secret agent in the Caconda region of Angola. He lived there, researching, exploring and sending many specimens and letters to his scientific correspondents in Lisbon, mainly J.V. Barboza du Bocage. Unfortunately most of the museum specimens have disappeared, as well as his many letters to Bocage, in a catastrophic fire in the Lisbon Museum in 1978. Anchieta collected 25 new species of mammals, 46 birds and 46 amphibians and ophidians. He did not write any scientific papers, but left this to his correspondents in Lisbon. Many of the species of birds, amphibians, lizards, snakes, fishes and mammals were named after Anchieta. Anchieta collected two female specimens of the Black-chinned Weaver, but the collection dates are unknown. The Black-chinned Weaver was first described in 1894 by Jose Vicente Barbosa du Bocage, a Portuguese zoologist and politician. He was curator of the Lisbon Museum. However, Bocage did not realise that he used an invalid name. Several years later, Reichenow realised this when he was working on his book on African birds. Reichenow provided a new name. 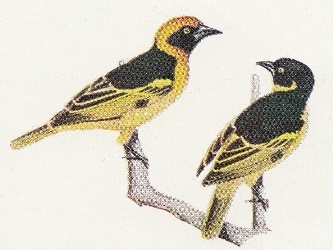 The Black-chinned Weaver was first illustrated by Mackworth (1963), many decades after it was first described. The next illustration to be published was a line drawing in Harrison (1965), comparing the basic plumage patterns of several weavers. Ploceus nigrimentus	Reichenow 1904a,	VÃ¶gel Afrikas 3 p.39,	Galanga, Benguella, Angola. nigrimentus, Latin: niger, black; mentum, the chin. Jose Alberto de Oliveira Anchieta. The types were in the Lisbon Museum, but were lost in a fire. The headers below refer to Weaver News items featuring this species. Click on a header to see the News item, which includes the full news item. (The number in brackets is the date that the news item appeared on Weaver Watch).